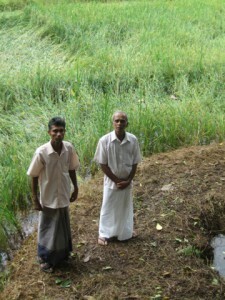 The village of Mederigama lies in the Division of Mawanalla, around one hour’s drive out of the town of Kandy in the direction of Colombo. Here, the new well provided by Project Sri Lanka enables 52 families to obtain water for drinking and agricultural purposes. The new well is sited on rocky terrain and local residents who are masons provided the skills necessary for its construction. The well with diameter of 15 feet required a substantial retaining wall. This project has dramatically improved conditions for the village families who until 2014 suffered severe drought seasons and water clogged with mud when rains came. Small scale agriculture, drinking and bathing are now possible within the confines of the village.